With a name like Salmon Fishing in the Yemen, you might expect this movie to be a snore-fest. However, it ended up far surpassing my expectations, and in fact is one of the better movies I have seen in the past few months. 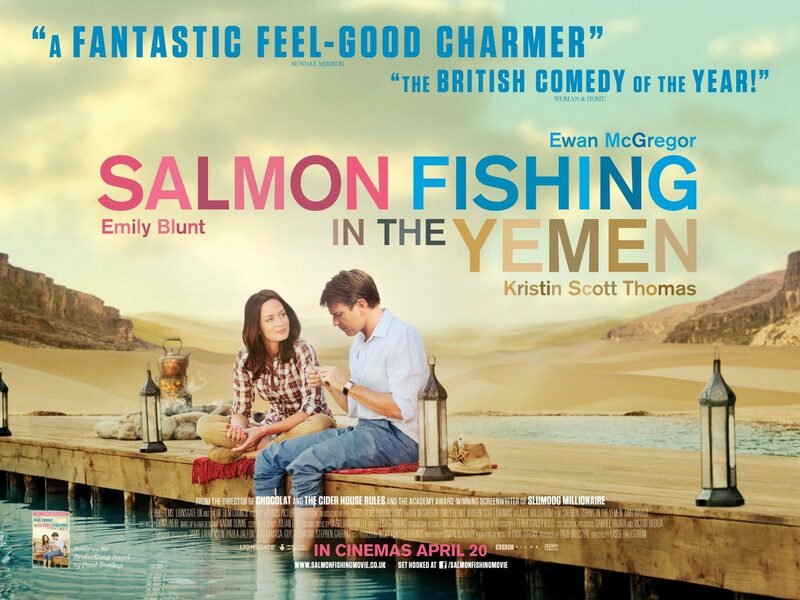 The humor was spot-on throughout the film, even in some of the more serious scenes, and it was interesting to see how complicated it was going to be to introduce salmon fishing to the Yemen. Harriet Chetwode-Talbot (Emily Blunt, The Adjustment Bureau) works for a very rich sheik (Amr Waked, Contagion) who wants to introduce the sport of salmon fishing near his home in the Yemen. Her first step is to contact Dr. Alfred Jones (Ewan McGregor, Beginners) to see if it's possible. He writes her back a polite but firm letter saying that there is no way it would be possible; however, once the Prime Minister's press secretary (Kristin Scott Thomas, Sarah's Key) gets involved, his boss gives him a choice: either work on the project or be fired. Smart man that he is, Dr. Jones chooses the former, and soon is being flown to one of the sheik's many mansions to discuss the idea with him and Ms. Chatwode-Talbot, as he calls her (never just "Harriet"). The two must find a way to obtain 10,000 salmon for the Yemen, and fly those salmon all the way into the country. The chemistry between Emily Blunt and Ewan McGregor was great, and I liked that although the ending was a bit predictable, it doesn't really manifest until the last few minutes of the movie. Harriet's boyfriend of only three weeks (Tom Mison, One Day) is in the army and is deployed to Afghanistan, and soon is announced as Missing in Action; she must deal with this while she struggles with an attraction Dr. Jones and also with their work with the salmon. The sheik, a virtual newcomer (Amr Waked), is also very good in his role, and Kristin Scott Thomas was funny as the snarky press secretary of England. Yes, see this film. You may be thinking, "What would I care about salmon? ", but in this film, despite its name, the salmon are almost not even needed; the movie is more about relationships, love, and what motivates people. The humor, too, is not what I expected; I was thinking the film would be rather dry. One of my favorite lines is when McGregor and Blunt are discussing religion, and saying how no one they knows go to church anymore on Sundays; McGregor pipes in: "We go to Target on Sundays!" The film is also tailor-made for a modern audience, as there are a few funny scenes where the press secretary (Thomas) is IMing with top government officials, asking if they know how to fish, as she is always looking for the next "good story" or photo op to be had. Salmon Fishing in the Yemen is a movie that should appeal to the masses, and the fact that it has some major star power in it doesn't hurt either. Salmon Fishing in the Yemen is in Detroit-area theaters today, March 30th, and is rated PG-13 with a runtime of 107 minutes. 4 stars out of 5.